Speaking in exercise of the right of reply, the representative of Sri Lanka said his delegation was deeply anguished by the remarks made by the Canadian Minister for Foreign Affairs, despite extensive efforts made to keep the Canadian delegation in Geneva informed of the reasons for the background to Sri Lanka’s objections to the Canadian initiative on “an interactive dialogue on the LLRC process in Sri Lanka at the March 2012 session of the Human Rights Council”, including domestic mechanisms put in place. The Sri Lankan objections had been endorsed by a wide cross-section of members of that Council. He said that, in the United Nations, an organization comprised of 193 countries, subscribing to a range of social, economic and political philosophies, procedure and process were critically important to ensure good governance and prevent intergovernmental organizations from being abused for narrow domestic political advantage and selective application of principle. The rule-based framework of the United Nations system, valued by all nations, must be safeguarded for the protection of all against such abuse. Turning to international terrorism, he said the scourge posed a threat, from which not even the wealthiest and most powerful of nations were immune, noting that terrorist groups frequently operated under the guise of front organizations. Conferring legitimacy on them had the inevitable effect of providing comfort and encouragement to what he termed “the merchants of terror”. As the leader of a nation that had paid a heavy price due to terrorism over a quarter of a century, he underlined his firm resolve to rid the world of terrorism, stressing the need for practical action on the ground that would send a collective message on the matter, loud and clear universally. 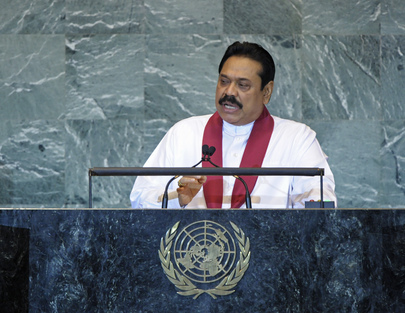 Stating that the interests of the developing world needed to be protected, Mr. Rajapaksa said it was vital to insist that the structures and procedures of multilateral organizations were uniform and consistent and devoid of discrimination. Sri Lanka had reasons for concern with approaches tainted by an unacceptable degree of selectivity, which he had brought to the attention of the organizations concerned in recent weeks. “The developing world must keep a vigil against these irregular modalities which should be resisted through our collective strength,” he said. After three decades of pain and anguish, today Sri Lankans of all ethnicities were free from Liberation Tigers of Tamil Eelan terror, and no longer lived in a state of fear, he said. However, he was mindful that the battle for peace was every bit as important and difficult as the struggle against terror. After the eradication of terrorism, his Government had turned its attention to building anew, the foundations of a unified and vibrant nation and drawing upon the inherent strengths of the country and, in particular, the unique calibre of its human potential. He listed as some of the major accomplishments: the revival of the economy, which had enhanced incomes and improved livelihoods; ex-combatants and other cadres, after exposure to programmes of vocational training and counselling had been re-integrated into society; and the electoral process had been restored after decades, making possible the emergence of a democratic leadership. He underlined the point that all those developments had taken place within the brief space of only 30 months, adding that, as a result of those achievements, Sri Lanka today was a self-reliant nation, with robust hope for the future and a strong economy, strengthened by inward investment inflows, unprecedented expansion of tourism and significant growth of international trade. Towards consolidation of those positive trends, leaving behind the trauma of the past, he asked for the international community’s hand of friendship and goodwill, based on an understanding of his nation’s determination to confront with courage the challenges of a new era in its history. Concluding, he said that the disproportionate pollution of the environment by industrialized countries, and the resultant impact on global warming and climate change, could not be remedied with any semblance of justice by imposing harsh restraints on developing countries, which had contributed very little to aggravation of the problem. Those circumstances heightened the importance of social equity at the international level, he said.